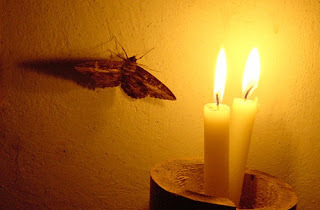 In sufi literature one of the most loved metaphor is moth and flame. The moth's annihilation into the flame has been drawn again and again as an analogy for the seeker in the sufi path who seeks annihilation into Divine Essence. The sufistic term for the annihilation or passing away into Divine is Fana. In the poem quote at the beginning of this post, from The Drowned Book, Maarif, the genius of Bahauddin Valad (father of Rumi) uses moth in a surprisingly beautiful metaphor. Here the analogy emphasizes the brightness of one's inner light that makes the sun look like a moth, apparently a small insect. Someone asked, "What is love?". I answered , "you will know when you become (lost in) me!" it calls God secretly, in the night. If we trace back this mystical love affair which is aflamed into the heart of seeker and through this alchemy an ordinary human being becomes an ashik or divine lover - we can trace back to the life of the Prophet Muhammad, the mystic master to whom goes back all the sufi lineage. The way Prophet Muhammad, may divine peace of union be with him, initiated this divine love into the heart of his holy companions are unparalleled in the history of mankind. No other Prophet or illuminated human being had so much love implanted for their teacher by his own companion in the very lifetime. And it manifested in their giving away everything for his sake. The Divine love took shape into illuminating love for the holy face of their beloved master. Their giving away everything, all worldly attachment for the Prophet is like the annihilation of the moth into the flame. Because true love in the sufi path is what prefers the beloved before the lover. It is when 'Thou' is transmuted for 'I'. And this is reflected in the affirmation of the prophet when he said, "By Him in Whose Hands my soul is, none of you will truly believe until I am more beloved to him than his immediate family." In another place he says, "None of you will truly believe until I am more beloved to him than his family, wealth and all the people." The holy companions of the Prophet loved him so much that after they departed from his presence, when they came back they complained that even through they were at their home, they felt 'homesick' by the absence of his presence. There's a Prophetic saying: "Abu Bakr (one of the most nearest companion and friend of the Messenger) was not considered as superior over the other people because of his fasting and voluntary contribution of his almsgiving only. On the contrary, he was honoured by his strong loving belief (iman) in his heart." I have come only to speak of Love. The sect of love is a religion to me.